Hello and good morning! Welcome to our January hop! 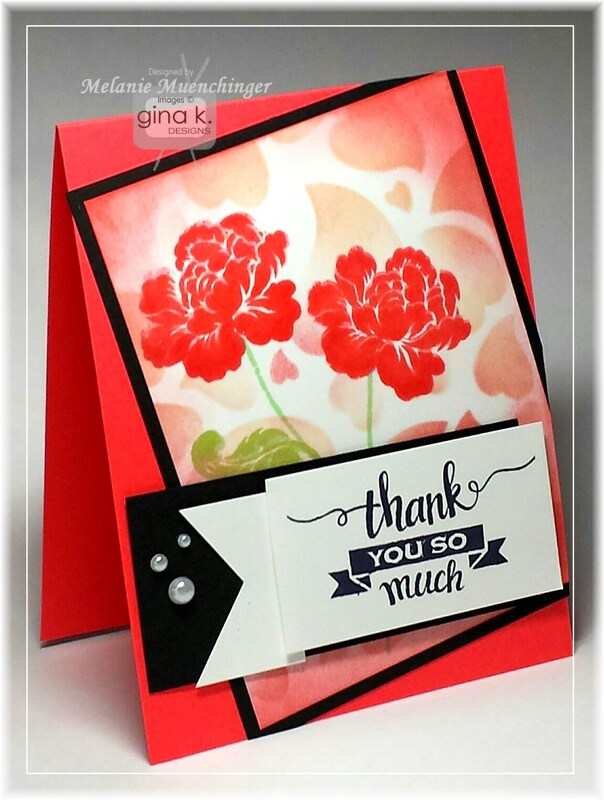 Today we are showcasing the new StampTV Kit Made With Love. 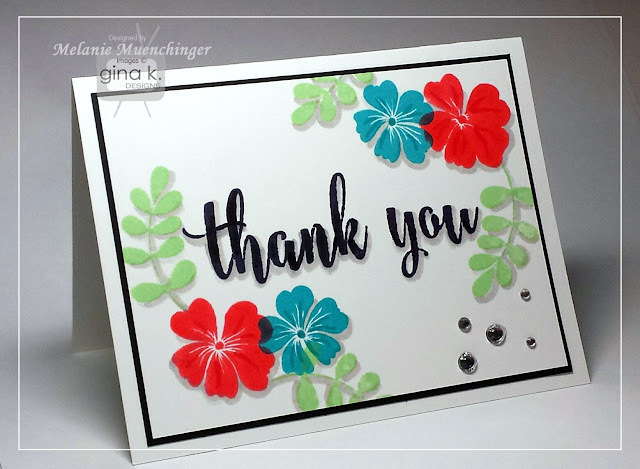 Please enjoy the gorgeous inspiration samples from the team and then comment on each blog for your chance to win an awesome grab bag of GKD goodies! To see who won, check the Big News Forum at StampTV on Thursday after the hop. 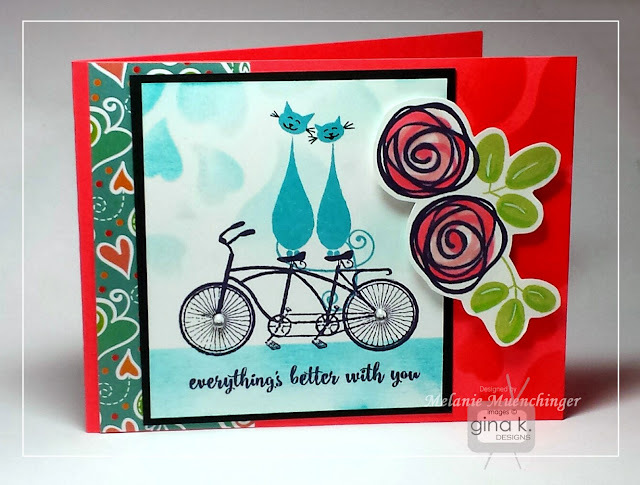 Here are some new cards I created with the Made With Love and Better With You stamp sets in the kit. And I just had to use all the new ink and cardstock colors, too! There are some really fun two step floral elements in this kit. Look how the new GKD Lipstick ink pops! POW! 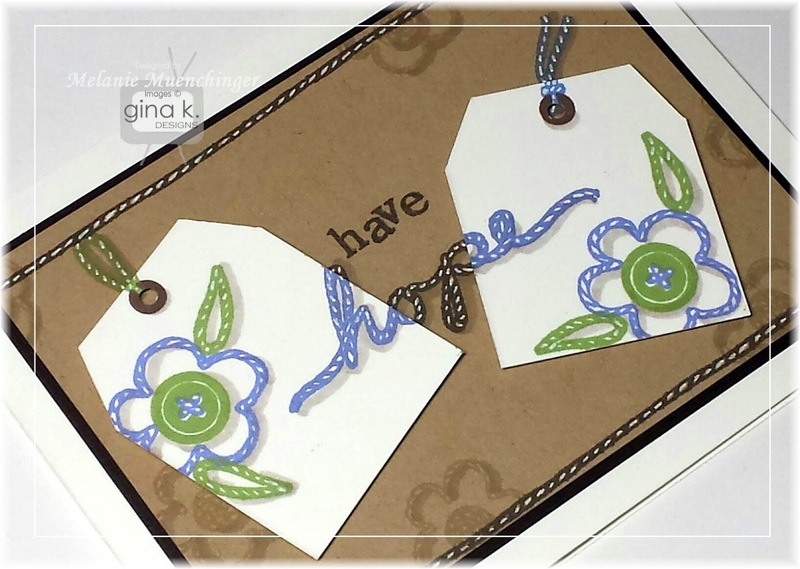 This one uses Massive Messages for the greeting, Gina's new incentive set. Yep, you need 'em both! 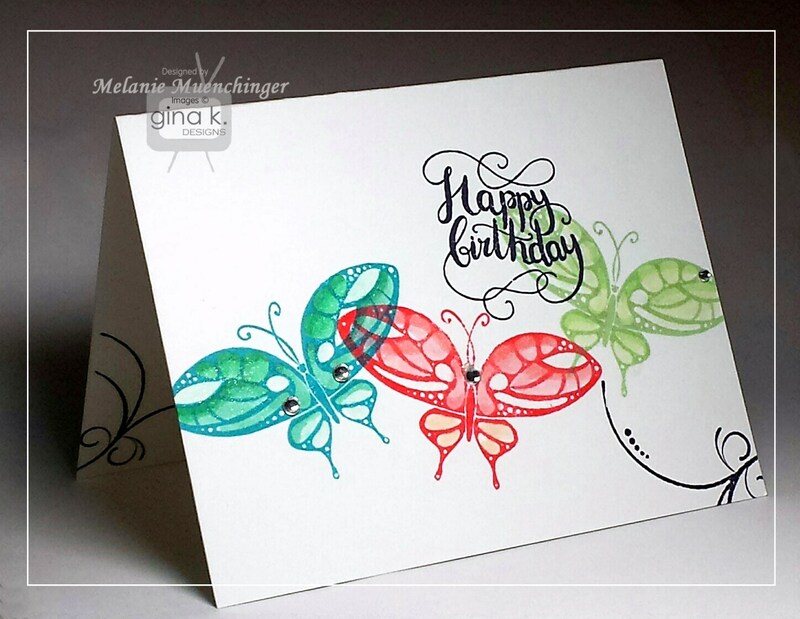 Add a drop shadow under everything with BG3 Spectrum Noir marker for dimension. 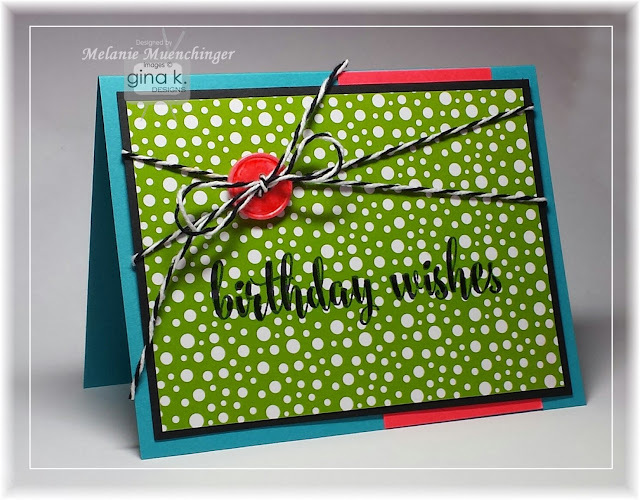 Here I used one of the card fronts from the foiling element page in the kit, but I don't have a laminator so it works really well as just a printed frame. I colored the stamped image as well as the loops in the frame and border with Spectrum Noir markers to jazz it up. LG shades look good with the new GKD Applemint cardstock. I like the look! The bird house is popped up. Aren't these kitties fun? I noticed they are the same width apart as the tandem bike's seats, so...Voila! Stamp the cats in an ink other black and you an draw in some simple faces, like they are facing forward. 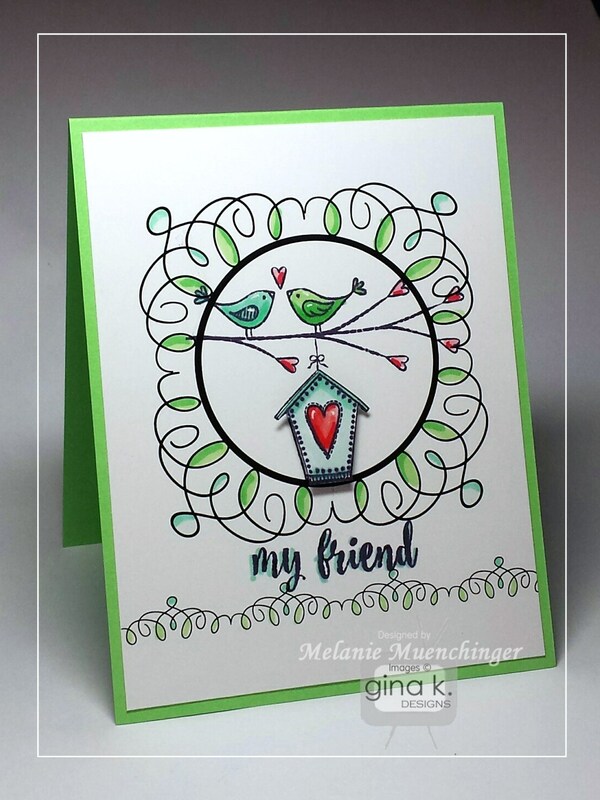 And finally, here is an easy one with no images, just showing off the new colors and patterned paper with one Massive Message! I colored a white button with the F1 Spectrum Noir marker, this is a great match for the new GKD Lipstick cardstock. These next two cards were in the release party, but wanted to point out some details. 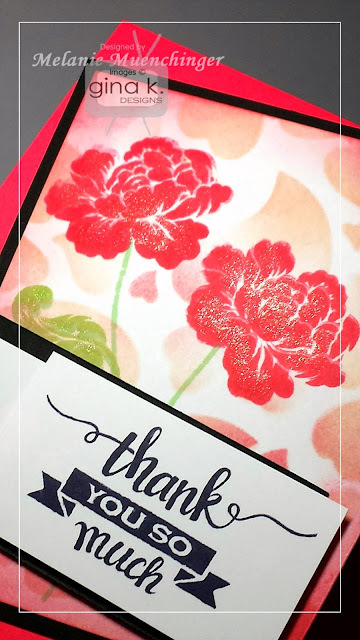 The heart stencil in the kit is really pretty, and sponged in a similar color ink as the flowers, they remind of petals more than hearts. I used GKD Peach Bellini over the stencil and then just a bit of the Lipstick at the corners. I swiped some Wink of Stella glitter pen over the flouncy flowers for some sparkle. It may be hard to see it in the photo, but I did the glitter thing on these butterflies also. 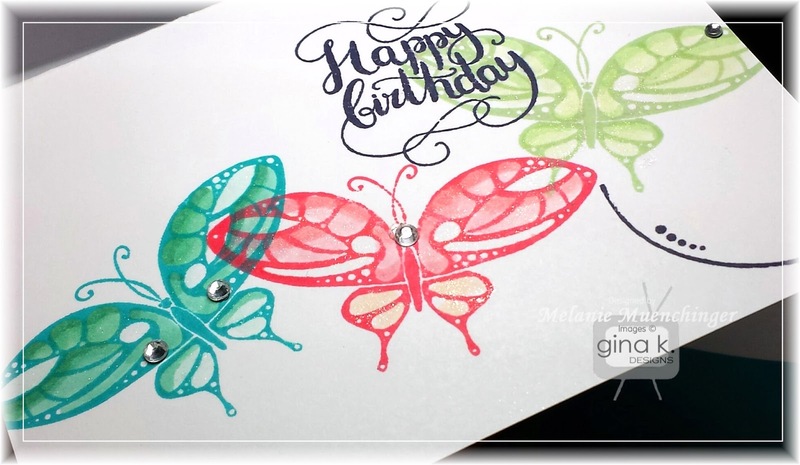 I really like them stamped in the new colors and then shaded like a gradient with two or three shades lighter of the Spectrum Noir markers in each color group (GT and BT for Blue Lagoon and CR shades for the Lipstick). The flourish in the kit makes a nice trail. And the Incentive set Massive Messages, when shopping don't forget to get enough to qualify for that if you can! Now please enjoy the rest of our hop and get some more inspiration from our fabulous Gina K. Designs team! Have a blessed day, thank you for making us a part of it! Hello! Today I will show you how to make adorable tags with ease using the eyelet and twine elements in my Twine Time set. 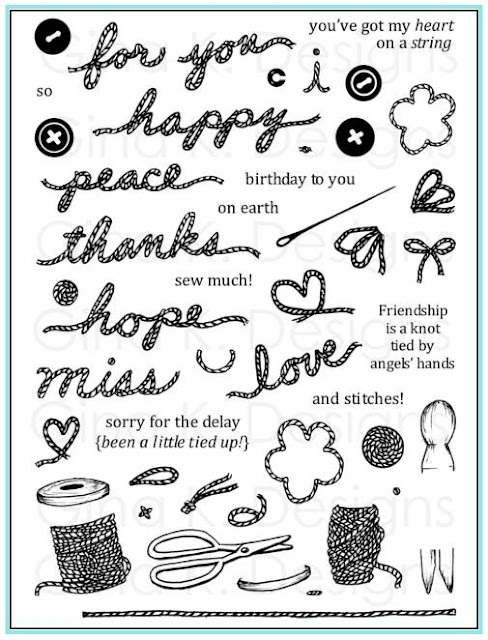 Embellished tags like these are so versatile, and the stamps make it faster and simpler than ever! I also share additional tips and tricks for creating this two layer greeting and stepped up card design. Please enjoy! * You can make this without the "have" from Triple Play Frame, but it's a fun addition, works with most of the twine script words! Something really blessed me today, I had to share with you. I apologize first to any of you are missing the the lack of more personal posts from me, I have just not been able to get them typed up in between videos and middle school woes! This happy accident was too good not to make time for. I was sitting in church today and was getting some really good nuggets of truth from our pastor Dr. Bowman. Many people, myself included, look up the passage of scripture on our smartphones rather than the good "book" as we follow along (as he refers to his own iPad), so it's common to have phones out. 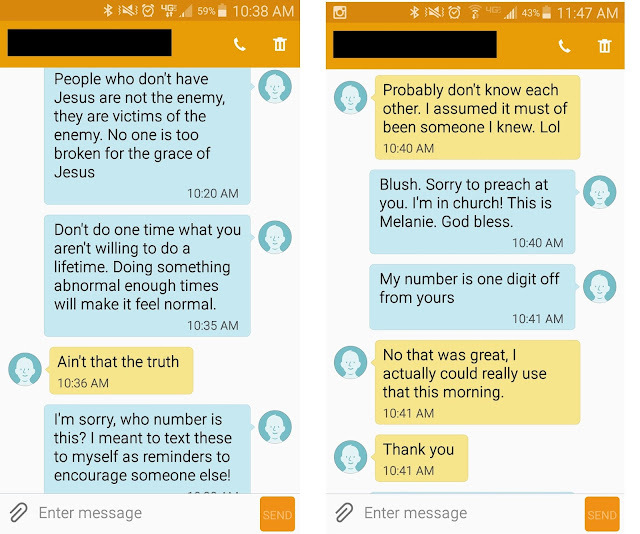 My teenager and younger son were in youth group and Sunday school that morning instead of the worship service so I decided to text a few takeaways to my own phone number to discuss with them later that I thought really speak to some things going on in my sons' peer groups right now (Don't ask. But you can pray, thanks in advance). Well, as I went to put my phone away, imagine my surprise when one minute later it buzzed alerting me I had I received a reply. (From my own number? Huh?) saying, "Ain't that the truth." Well! I have to admit, my first thought was, "God??" but after a few seconds of processing, fear crept in that I must have sent it to someone in my contact list by mistake (Ack! Not that that would be wrong, but without a even a "hello" or "how are you?" to lead in, I get that the message could sound a *bit* condemning, just sayin'!). Sheepishly, I replied along the lines of, "Um...who is this? ", and got a reply that it was a woman who lives in my same city, the number was just one digit off. Oops! Our convo, numbers and names removed (and a tiny bit of small talk trying to figure out what happened in between), is below. I went back inside and just felt crazy good as we wrapped up the service worshipping with The Robin Wymer Band, and rejoicing about how God works. I could have sent it to a fax machine, or the electric company, or someone in another state if that one wrong digit was in the area code instead, you know? And most certainly nothing of my own doing, other than listening to the prompt of the Spirit to take that note, and God used it. (I have since been informed I don't really need to text myself grocery lists and the like, as Jonathan says my phone has something called "Notes" ? But you all know how I roll with technology. I think I'll continue with the texts...who knows who we'll* reach? By the way, I also like how the person couldn't call it anything but "the truth"! Not just an "I know, right?!" or "Makes sense..." or "Food for thought", or "WTH?**". His word never returns void. Amen! Have a blessed Sunday! 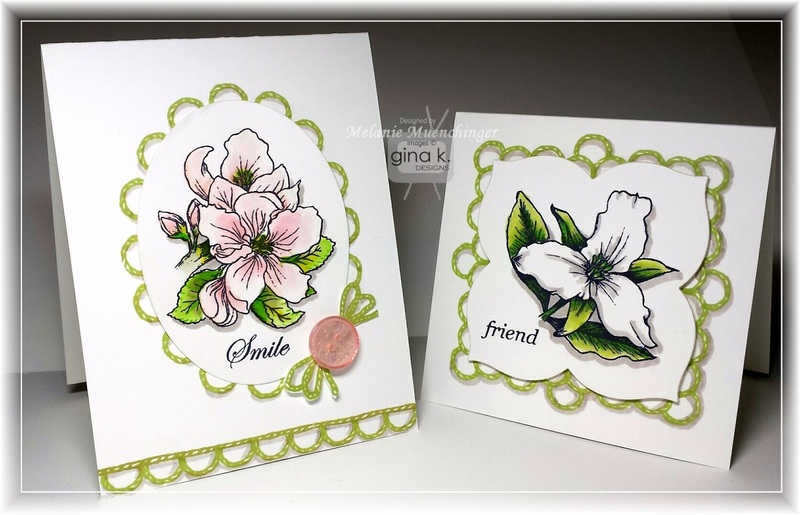 The trillium I color in the video is from Fabulous Frame . (The pink flower shown in the sample at beginning is from my Stately Flowers 9 set, currently out of stock, or I would have demonstrated it today! On order and back in stock soon!) I will definitely be making and showing twine frames in more shapes since I have oodles and oodles of dies! You can try this with the loop in the set as well, which I showed in the last video for a straight border, but it's a little trickier to line up around an irregular shape since one leads into the other, know what I mean?